New dry erase paint from InPro allows schools and offices to turn walls into whitebaords. Exclamation Paint covers up to 70 square feet using a simple three-part kit. It rolls on like traditional paint, and applies seamlessly over any existing smooth surface to create a writable/erasable dry erase area. A great solution for schools and offices, InPro has launched a new low VOC whiteboard paint under the Exclamation Paint™ trade name. Turning an entire wall into a dry-erase whiteboard means schools and offices don’t have to be constrained by traditional framed whiteboards. 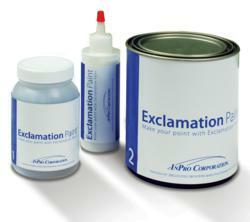 Exclamation Paint covers up to 70 square feet using a simple three-part kit. It rolls on like traditional paint, and applies seamlessly over any existing smooth surface to create a writable/erasable dry erase area. In addition, the new InPro whiteboard paint cures in about 5 days, which is much faster than the 7-10-day cure times in competing products. InPro’s faster cure time means less downtime. Exclamation Paint is made from a low-odor, water-based solution for easy clean up and installation. The whiteboard paint can easily be applied by the painting contractor already on site, or it may also be applied by a facility maintenance personnel. Exclamation Paint is certified to be low VOC and meets LEED® indoor environment quality criteria. Additionally, it can easily be painted over should the room configurations change, which means no landfill contribution from having to demo the wall. InPro is the nation’s premier manufacturer of building products, including door and wall protection, decorative surfaces, expansion joint systems, cubicle track & privacy curtains and signage & wayfinding. InPro products are used in the healthcare, senior living, hospitality, education, and government sectors.